Genie is extending its Lift Guard range of secondary guarding solutions to cover scissors and mast lifts. The Genie Lift Guard Contact Alarm is designed to activate when a whisker mounted on the lift’s platform guardrails comes into contact with an overhead obstruction. In this scenario, it immediately stops all machine motion, sounds an alarm, and initiates flashing beacons. This combination alerts the operator, occupants and ground personnel to a potential hazard. The standard configuration for electric slab scissors and vertical mast lifts is two activation whiskers – mounted at the front and rear of the platform. Zach Gilmor, Genie product manager for Europe, Middle East, Africa and Russia region said: “Operator safety and productivity are key considerations in the Genie design process. 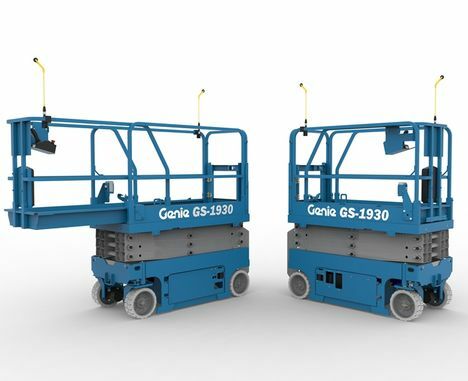 The Genie Lift Guard Contact Alarm system for slab scissor and vertical mast lifts is designed to supplement a trained operator’s situational awareness and provide a secondary layer of guarding while working at height. Genie plans to go into full production with the new feature later this year. 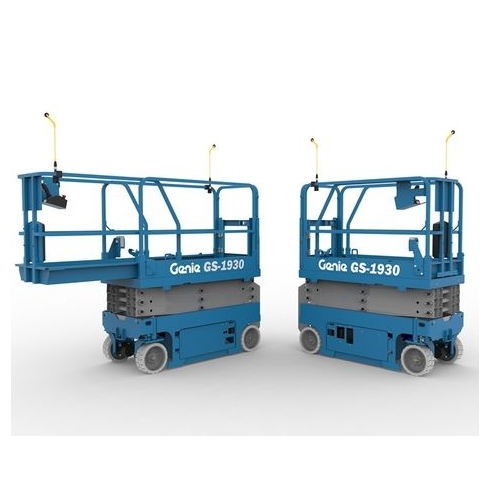 In addition, it will offer a retrofit kit that is compatible with Genie Smart Link system-enabled scissor lifts and vertical masts produced from 2011-2018. It follows the successful launch of the Lift Guard Contact Alarm system for boom lifts in 2017.